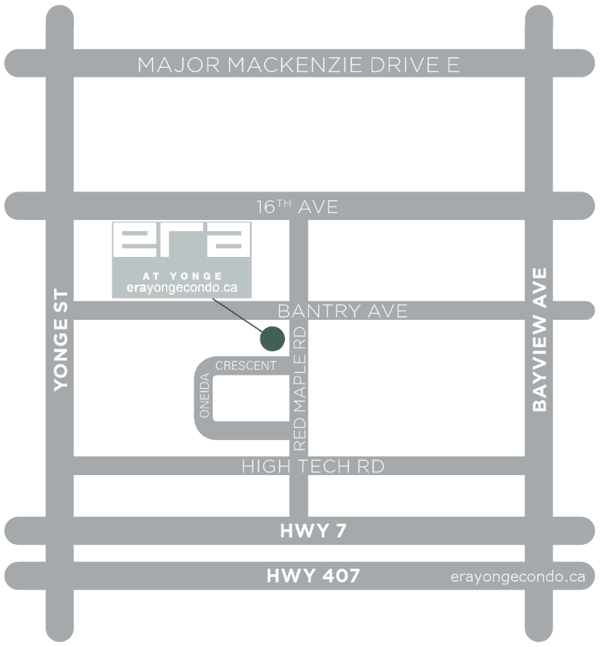 Era at Yonge is a new condo development by Pemberton Group in the Highway 7 and Yonge neighbourhood. This is the third tower in the Pemberton's Yonge Parc Condo community at High Tech Road in Richmond Hill. Pemberton has chosen a location that's one of the most wonderful & fast growing communities in Richmond Hill area. The building will have approximately 263 suites ranging from 1 to 3 bedroom and best in class amenities within the building. Era at Yonge is being developed by Pemberton Group, the company with experience spanning decades and more than 10,000 homes built, including Condos, Townhomes & also commercial developments. Within 2017 itself, the company launched and sold 6 condo towers alone at various location in GTA. Some of their recent developments include Time & Space Condo towers in Toronto Downtown, Yonge-Parc 1 & 2 buildings in Richmond Hill, Mill Square condo towers in Erin Mills community in Mississauga and GO tower in Maple area of Vaughan. The Company takes pride in building successful communities inhabited by end users, that boast of craftsmanship, exceptional amenities, latest in home building technologies and yet are affordable. Floor Plans and Prices of Era at Yonge Condo will be sent in the email to all the registrants. Please Register to get all the information. From 640 sq. ft. To 1070 sq. ft.